The Nureva Span collaboration software has added customizable templates that are designed to facilitate the collaboration process. “As enterprise adoption of Span continues to grow, we have seen firsthand how our customers are using it to improve the efficiency and effectiveness of their collaborative processes,” states Nancy Knowlton, CEO, Nureva. Nureva explains that some of the ways users can employ the templates include paper-based or physical project boards that are commonly used in sprint planning, Kanban and pull planning scenarios. Nureva says these templates are easily customizable and images such as an overhead view of a property site can be transformed into intelligent templates divided into color-coded zones. Users can also employ the templates with Microsoft applications like PowerPoint and Excel. In these Microsoft programs users can automatically assign color to notes that are placed within groups and subgroups. Find more ISE 2018 coverage here. Nureva says these color options provide users with “rich project” information at a glance, and users can also customize stock templates that are readily available within the Span software such as SWOT analysis and fishbone diagrams. 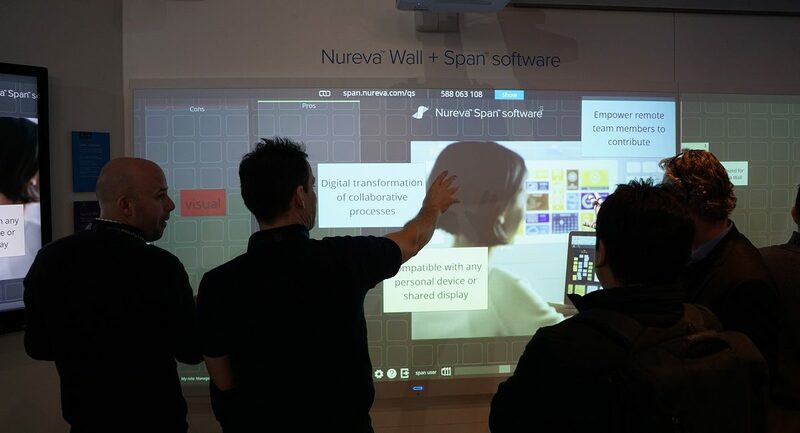 Nureva adds the intelligent templates in the Span software are designed to appeal to a wide array of process-driven teams that meet in physical and virtual spaces to prioritize, plan, track and visualize the various contributions of team members. Learn more about Nureva Span here.